It’s common today to see eggs at the store touting some label or phrase to set them apart from the standard, conventionally produced egg. Things such as “cage-free,” and “free-range,” (which really aren’t as noble as they sound) are common, and even “vegetarian fed.” This last one is often a bit of a surprise to anyone who grew up with laying hens. Vegetarian? There’s no chicken, given any chance at a natural life and diet, who would ever be a vegetarian. Laying hens require a specific amount of protein in their diet to maintain a healthy life and egg production. Naturally and ideally, a lot of this protein is found by foraging for worms, grubs, and bugs (even mice and snakes when the opportunity arises!). 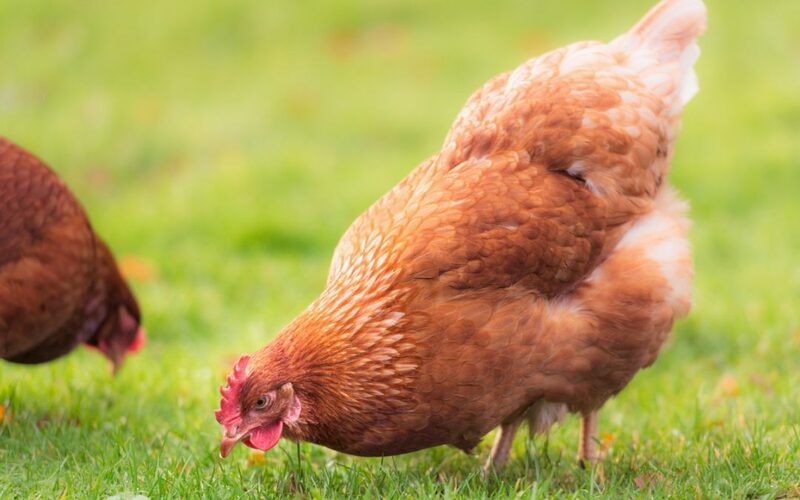 Scratching and pecking are what chickens love to do, and they get to express their chicken-ness to the utmost when seeking out little proteinaceous tidbits to enjoy. This tells us, that if these “vegetarian fed” products are labeled accurately, that the hens producing those eggs are not able to live as naturally as one would hope. Perhaps they’re kept always indoors, or in a barren area where there is nothing to scratch or peck for. We don’t mean to imply that vegetarian fed hens are protein deprived. That would not be helpful to either the producer or the consumer. Vegetarian feed gets its protein from plant-derived sources, which often means soy. That may or may not be a problem in itself, but since 94% of US grown soybeans are genetically modified (2016), there’s also a good chance vegetarian feed includes GMOs. No thanks. Here at Rafter W Ranch, our hens are given the chance to be all they were made to be! They hunt for bugs and worms, scratch and peck to their hearts’ content, enjoy a fresh buffet every time their pen is moved, help keep our cattle healthy, and produce an incredibly nutrient dense, healthy product. You have our promise that our hens are never fed anything with GMOs, soy, or corn. Check our shop for availability.